Photo with thanks to Maria J Broomfield. 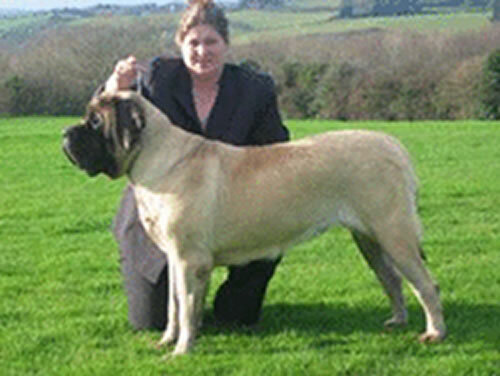 Mastiff Breeders & Puppies For Sale If your a Mastiff breeder and have Mastiff puppies for sale, send us your details for free and we will add to our Mastiff Breeders page. Mastiff Rescue Center Visit the Mastiff rescue centers if your looking to rescue a Mastiff, as well as learn more about the breed or just support the rescue centers for there hard work. Origin / History The Mastiff is a breed of large dog originating in England. 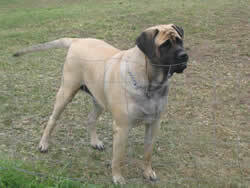 There are actually several breeds of the same name, although the word originally refers to the Old English Mastiff. It is the oldest known breed in Britain, having existed in England for at least 2,000 years and the rest of Europe for over 4,000. 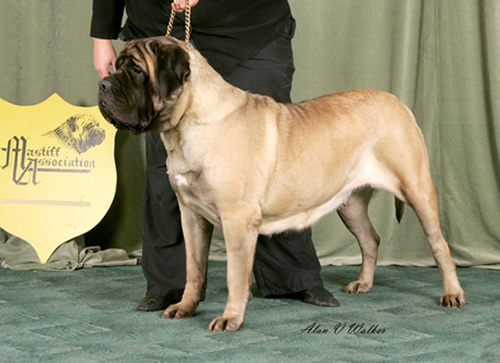 The early Mastiffs were used in blood sports such as lion-baiting, bull-baiting, and dog-fighting. The Cruelty to Animals Act of 1835 ended this practice and almost wiped out the breed, although its popularity in America kept it alive. They were also used as war dogs; a Mastiff figured prominently in the Battle of Agincourt in 1415 when it stood by its wounded master, Sir Peers Legh, for several hours after the battle. This same dog became the foundation of the Lyme Hall Mastiffs, which helped establish the modern-day breed 500 years later. Appearance It has a distinctive square head with a short muzzle, and a prominent dewlap (a flap of skin) on its chin. The coat is short and lies close to the body. The eyes and ears are small in proportion to the head. Its broad body sets the forelegs wide apart, giving it a sturdy, powerful stance from any angle. Colours Acceptable colors for the Mastiff are silver, apricot, fawn, brindle, or any combination of these. Regardless of the color, there should always be a black mask on the muzzle. Temperament The Mastiff perfectly embodies the phrase ‘gentle giant.’ Despite its size—and its history of war and blood-fighting –the modern Mastiff is gentle and affectionate, especially toward its human family. Its calm nature makes it a great companion for children, although it is not recommended for toddlers because of its size and weight. It doesn’t bark much except when provoked, but it instinctively defends its family and territory with great strength. Height and Weight 70 - 76 cm in height and 79 - 86 Kg in weight. Males are larger than females and at the top end of the size ranges. It is one of the heaviest of all dog breeds. Common Health Problems Mastiffs are prone to hip and elbow dysplasia, as are most large dogs. They are also susceptible to bloat (twisted stomach) and should not be fed more than three small meals a day. Adult females may suffer from vaginal hyperplasia. Other health risks include coronary heart disease, gastric torsion, and eye problems. Living Conditions The Mastiff will thrive equally well indoors and outdoors, although a small yard is recommended for occasional exercise. This breed is fairly inactive indoors and will do well in an apartment, although it needs sufficient space to stretch and get around. Exercise Requirements Mastiffs need sufficient exercise to prevent bloating, dysplasia, and other problems common to large dogs. Exercise should be regular but not too taxing, as these dogs tire easily due to their weight. They tend to be lazy, so they should get used to physical activity at an early age. Short daily walks are recommended, as well as mental stimulation and play. Training Requirements Protection training is unnecessary, as it is in the Mastiff’s nature to ward off intruders. However, socializing and obedience training should be started early since they tend to be obstinate and combative with other dogs. 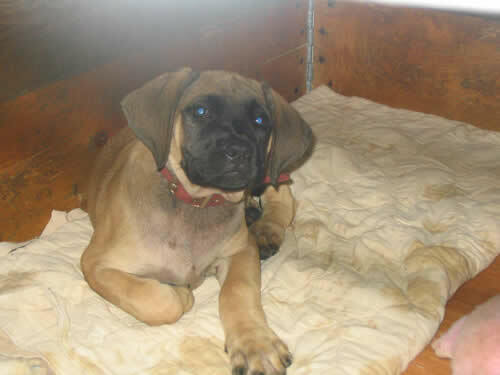 If untrained, a Mastiff pup may bite and snap at children who are a little too playful. Problem solving abilities tend to be low, but they can be stimulated with occasional mind games. House training can be difficult but will be helpful, especially with males. 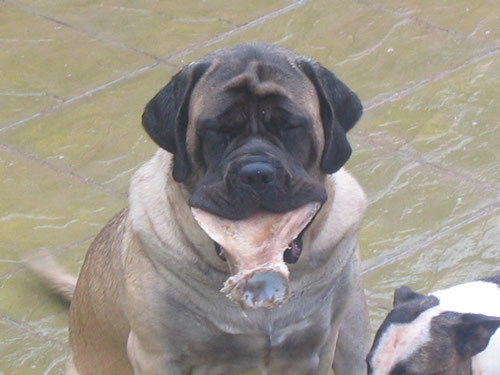 Life Expectancy Mastiffs have a life expectancy of about 10 to 12 years. Grooming Because of its short coat, the Mastiff is fairly easy to groom and doesn’t shed heavily. Bathe only as needed, comb lightly with a bristle brush, and towel dry. Wiping with a chamois cloth will give it a smooth, shiny finish. More Mastiff Information: Check out our Mastiff Clubs and links to more informative websites dedicated to the breed.